My wonderful friend and reader, Kim, has shared some really great recipes with me in the past. I am super excited to have her Guest Post here 🙂 These cookies look absolutely amazing!!!! I think these would be great for any holiday or event as they are so versatile!! YUM!!!! So I always find family holidays a bit tough because they always revolve around candy and sweet baked goods. So every year I usually try out a new recipe of some sort to see how it comes out and to test it on my family. My goal is to find the perfect vegan holiday recipe that not only will I enjoy, but my family will as well (and they are picky eaters). So I found this recipe in VegNews and decided to give it a go. Not only did it come out fantastic but my family can’t get enough of them. 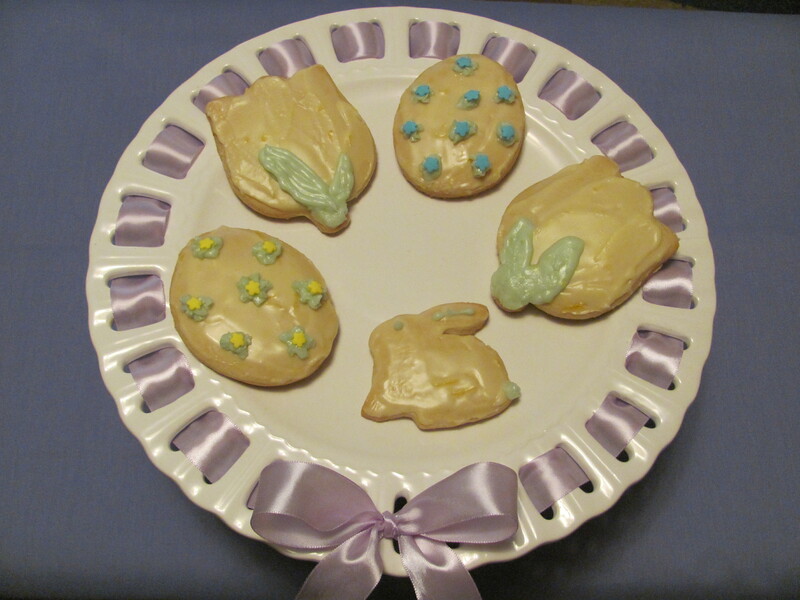 My Grandmother and myself were up to our elbows in cookies for Easter, with frosting everywhere. We spent a good amount of time trying to design the perfect cookie to be photographed, but got so tired by the end of the night that we only shot a few cookies and decided that we would just slap some frosting on the rest for the family. They are so delicious that we didn’t think the family would mind or notice. Hope that you enjoy this recipe as much as me and my family does. To prepare cookies, preheat oven to 350. In a large bowl cream margarine and sugar until fluffy. Add egg replacer, vanilla, and sour cream and mix well. Remove dough from fridge and roll out 1/2 inch thick on floured board. Cut using cookie cutters. Bake for 8 to 10 minutes until golden. Allow to cool before frosting. And be warned these are addicting, be prepared to eat at least 5 before you even offer them to anyone else because they are that good. My grandmother ate at least 2 handfuls by Easter and she doesn’t usually eat that much sweets.